A radio personality in Oregon took a close look at what students in a local school were eating – or rather what they were not eating. Upon examining dozens of lunch boxes and school meals, the reporter found that almost none of the lunches had any vegetables in them! This is surprising news considering that the USDA suggests at least half of all meals should be fruits and vegetables. Read the rest of this story here. Most of the meals the kids were consuming consisted of simple carbs and processed cheese, such as pizza, ham and cheese sandwiches and pancakes. On the bright side though, the kids seemed to be aware that vegetables were important and that they should be eating them more often than they were. As schools (and students) start to become more aware of what is going on kids’ plates, maybe its time to look at the plates themselves. The greasy pizza that kids are so accustomed and fond of eating at lunch time can easily soak up some of the chemicals found in styrene, the primary ingredient in foam trays. This might not seem like a big deal, but styrene is a possible carcinogen, and when you add up the breakfasts and lunches kids eat at school from kindergarten through high school, that’s a lot of exposure to a harmful chemical. 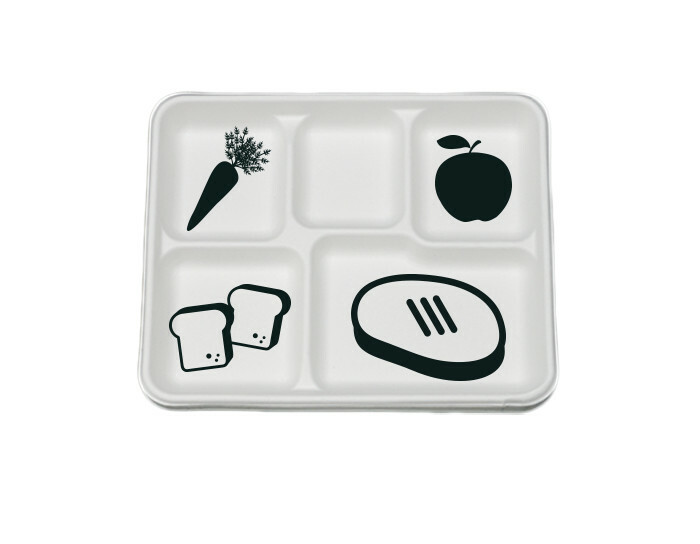 They say exercising and healthy eating go hand in hand, shouldn’t healthy food and healthy trays go hand in hand as well? Trays made from sugar pulp are not only more sturdy than their foam counterparts, they are also fully compostable, meaning less damage to the environment and little minds. Composting schools are popping up all over the country, more and more schools are recognizing composting as not only a way to help the environment, but also to teach students how to be good stewards of the earth. These schools have set up compost bins in the lunch rooms and then take the scraps and use it as fertilizer for their school garden. Imagine how much the students must learn seeing the process for themselves, and getting to be a part of it. Stacking compostable trays and adding them to the pile would hardly be any work at all compared to the great strides that have already take place. From the looks of it, schools are heading in the right direction when it comes to healthy eating. It’s time to take it a step further and encourage kids to not only eat their vegetables, but to use their trays to one day grow more.